Starting a School from Scratch! So You’re Building a School from Scratch? When LeBron James opened the I Promise School in Akron, Ohio, at the start of this school year, the optimism was off the charts. Here in Richmond, Johnny Harris can relate to the euphoria of starting a school from scratch, even though he lacked the resources and massive media attention that the basketball legend’s school attracted. When Harris launched Lynnhaven Academy in 2012, the educator did have the vision, mission, and drive to make his independent school work, despite challenges – including four relocations in five years. 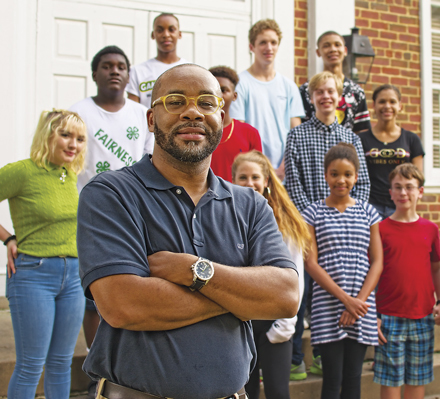 For this school year, Lynnhaven – which enrolls students in grades seven through twelve – has settled into the former Richmond Waldorf School at 1000 Westover Hills Boulevard. Now there’s space (40,000 square feet in total) to grow enrollment from forty-two to 200 students at the independent day school, which San Francisco Magazine’s Wander List named one of the top three private schools in Virginia. “What drove me to do this was my personal experience in elementary school,” says Harris, who grew up in Bedford County. “The only thing I could think about was visiting the James River and fishing. I was a hands-on learner; that was my learning style. I wanted to teach kids how I wanted to be taught,” says Harris. The hands-on learning environment at Lynnhaven drives authentic understanding and application of knowledge, says Harris. “Richmond is our campus for learning,” says Harris. “When you think about learning, people think about being in the classroom and sitting in rows, and the teachers take over.” Harris says Lynnhaven students have all that and much more. “Forest Hill Park is our learning lab. We go to Lewis Ginter Botanical Garden twice a month for a science lab. We are monitoring the water quality for the Virginia Department of Environmental Quality through a grant from the Robins Foundation,” says Harris, who named the school after his deceased sister, Jennifer Lynn, a nurse who was also an experiential learner like him. For Lynnhaven students, trips to the East End Cemetery and other Richmond-area sites present a host of opportunities to learn on many different levels. “We’re at the cemetery not just cleaning, but actually learning about the time period and why there was a need for a black cemetery back in the early 1900s,” says Harris. “We use the James River as a learning lab for soil sampling, bird watching, and water sampling. We have a collaboration with the VCU School of Engineering to build a robotics program with a lab,” among other community-based learning initiatives. The diverse school offers grades seven through twelve and charges $16,000 annually for tuition. The teacher student ratio is one to seven and will never be higher than one to ten, according to Harris. Half of the student body previously attended private schools, but aged out. The rising ninth-grade class has fifteen students. Other demographics: 70 percent of the students are boys; 52 percent of students are white; and 48 percent are black. 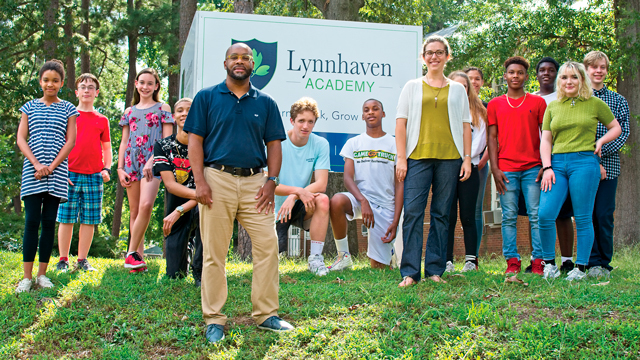 Lynnhaven Academy in Richmond opened in 2012 and enrolls kids in grades seven through twelve. Johnny Harris is executive director. Since its founding, Lynnhaven has graduated thirteen students. The pride shines in Harris’ eyes when he says Lynnhaven graduates have been offered over $2.1 million in merit scholarships for higher education. The school offers extra-curricular activities, sports, and student leadership opportunities. The budget this year is $670,000 compared to $600,000 in the previous school year. In 2012, he left a job in Northern Virginia as an administrator and started an education consulting company in the basement of an insurance company’s office on Parham Road, where his work included offering psychological evaluations, testing for dyslexia, tutoring for homeschool students, and offering consulting services for parents and school divisions. 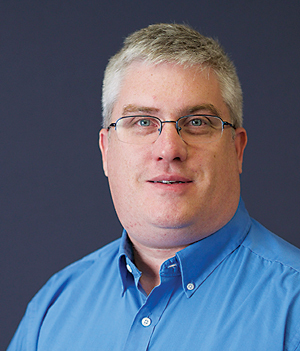 This year, Harris moved into a new role as executive director of Lynnhaven Academy. Casey Hitchcock, who previously served as head of middle school and taught English, replaced Harris as the new head of school. Looking to enhance his influence on Virginia education, Harris has accepted a position with the Department of Education as an education specialist. If there’s a recipe for creating and sustaining an independent school, a clear mission and a dedicated team rank among the essential ingredients, says Audrey Smith, executive director of the Garden Schoolhouse, an early education program with a focus on healthy development and school readiness. The North Chesterfield school focuses on cultivating a passion for learning and intellectual curiosity in early learners and has a capacity for eighteen students. Tuition is $200 a week. “We’ve been selected to participate in the mixed delivery of Chesterfield’s preschool pilot program because the local schools do not have enough capacity for these students,” says Smith. “In Chesterfield, only 20 percent (of eligible students) are enrolled in pre-kindergarten, so they are looking for a private setting for these children.” Participating schools must be a Virginia Quality-rated school. Virginia Quality (virginiaquality.com) is the state’s voluntary rating and improvement system, which sets standards for quality and provides a path for continuous improvement in early learning programs. An emphasis on understanding each child’s unique talents and skills is paramount at the recently renamed and now co-ed Garden Schoolhouse. It was previously the Chesterfield Innovative Academy for Girls when it opened in 2014. Co-founded by Smith and Betty Walker, who is the development director, that first version of the school started with one class of 3-year-olds. “We added kindergarten and then added first grade, and that’s where enrollment fell off,” says Smith. Parents could see their daughters were reading above grade level and math skills were improving, so they transitioned their child to the public school system. Smith says those enrollment trends indicated what families wanted from their small independent school. “Our parents were actually telling us what our niche was,” says Smith, about the concept of school readiness. “We realize many students have no preschool or pre-kindergarten experience before going to school, so that is a vacuum. As a nonprofit, we decided to meet the community’s needs and focus on school readiness,” says Smith, who has a master’s degree in educational leadership and taught students for fifteen years at Falling Creek Middle School in Chesterfield County. 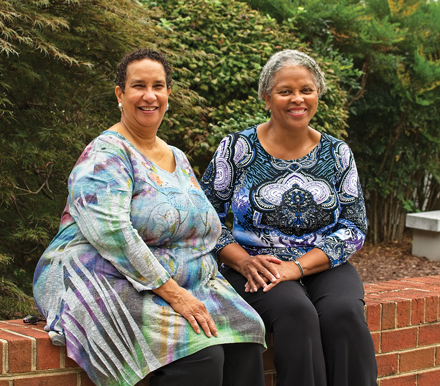 Betty Walker and Audrey Smith make up the leadership team at the Garden Schoolhouse in Chesterfield County. The Garden Schoolhouse embraces the same philosophy and developmentally appropriate practices used when the school was the Academy for Girls and provided single-gender education for twenty-one girls. “All of the things we did for girls that we thought were important for girls – particularly in light of the Me Too movement – had us recast and wonder, If we start boys at this younger age and we teach these same habits of mind, how will our world look when the boys and girls are learning together?” says Smith. Educators considering starting a school from scratch must be open to readjusting when necessary to best serve the needs of their families. Parents of children at Chesterfield Innovative Academy for Girls told the leadership what they wanted in a school. Ultimately, for Smith and Walker, that meant looking at a new co-ed model and changing the school’s name. Smith and Walker have learned a lot from the families they have served over the years, and they’re looking forward to reaching more children in the coming years. The mission answers the question, Why are we here? The school’s philosophy answers the question, What do we believe about education? The objectives tell what the school will do to accomplish the mission that is aligned with its philosophy. Parents seeking information about Virginia’s laws pertaining to independent schools can get a copy of an annual guide produced by The Virginia Council for Private Education (vcpe.org), which oversees accreditation of private preschool, elementary, and secondary schools in Virginia. of student credits from the state-recognized accredited private school to a public school and ensures recognition of teacher licensure credits for time served in an accredited private school. Independent schools are a bit more direct about their mission and purpose, and that allows families to be more deliberate about the decision and find a school to fit their child’s needs, according to Becker. “Some schools have a particular philosophy, and the family can decide if that suits how they want their child educated,” he adds. Beyond checking accreditation for assurance in quality, parents need to look into the educational background and experiences of the leaders of the school and the teachers. “See that they have a real understanding of the school’s particular orientation. If a school is committed to progressive education, then the teachers and leaders should have a background in that,” says Becker. School websites provide a lot of that information, so carefully exploring what they say in their mission statement is key. Check that the language in the school’s printed materials and website align. If it’s a college preparatory focus, review to ensure that its stated specific orientation and mission match up, Becker says. “It really is a matter of thinking about what kind of educational experience you want for your child, and asking if the school embodies that orientation,” Becker says. Previous articleWhat Would Your Mother Say?